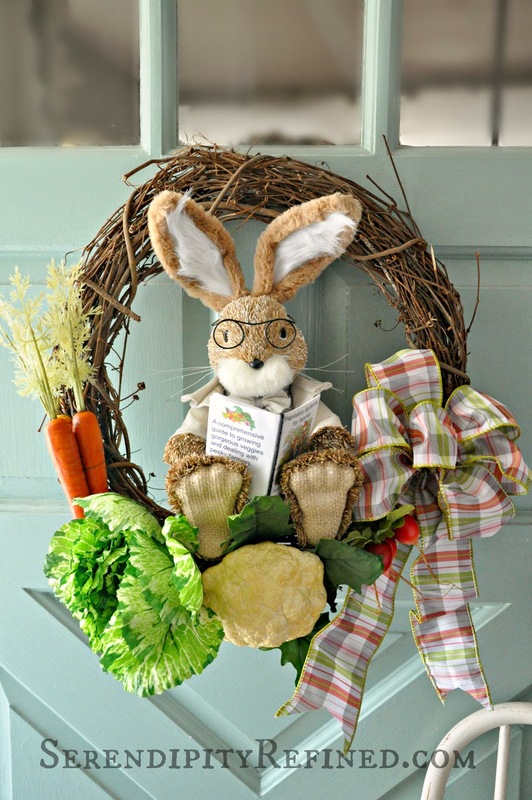 This year, my spring front door wreath decoration is different from what I usually create. 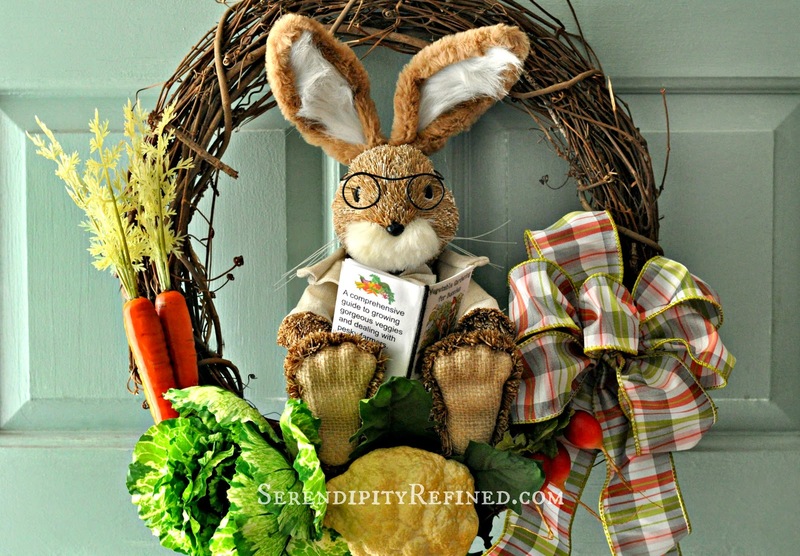 Instead of spring flowers, I chose faux vegetables and when I'm thinking about spring and vegetables, there's only one story that comes to mind....the one about a large vegetable garden and a pesky little bunny named Peter Rabbit. 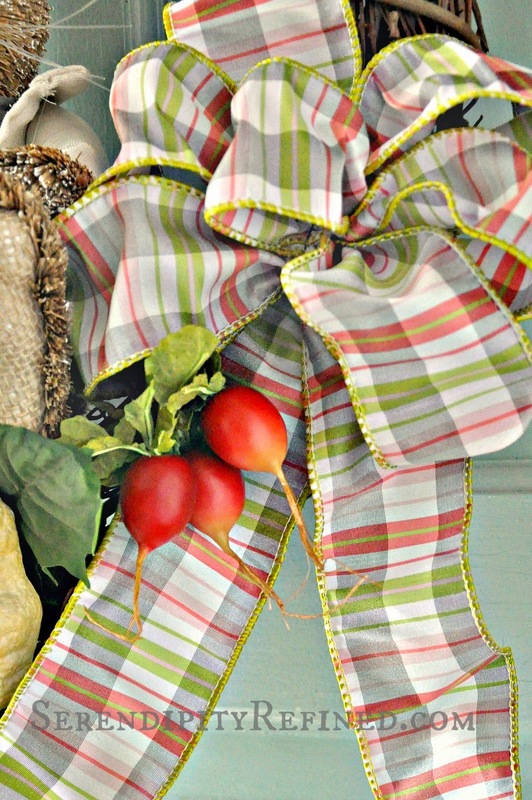 This wreath is an easy DIY that took exactly ten minutes to assemble. 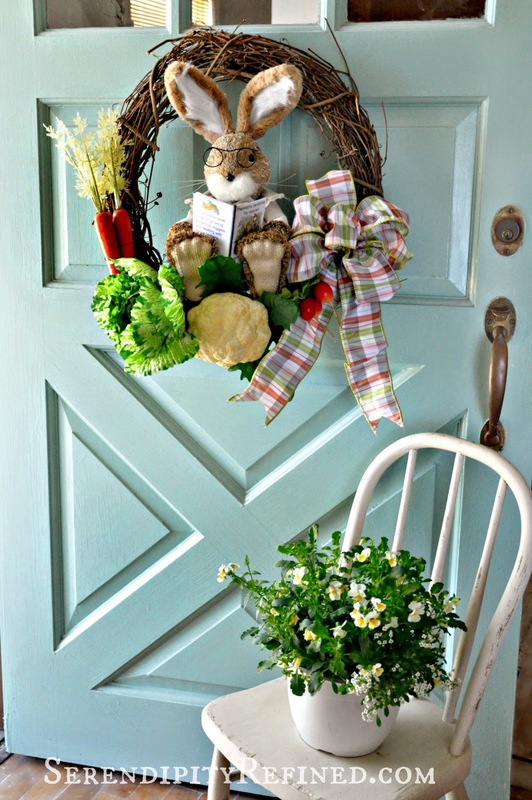 To make this simple spring door decoration, I grabbed a grape vine wreath from the basement and some faux veggies from the craft store. I always knew that there were faux apples, pears and oranges but I was surprised to find that there is also a great selection vegetables. So many, in fact, that I had a hard time choosing which ones to use. 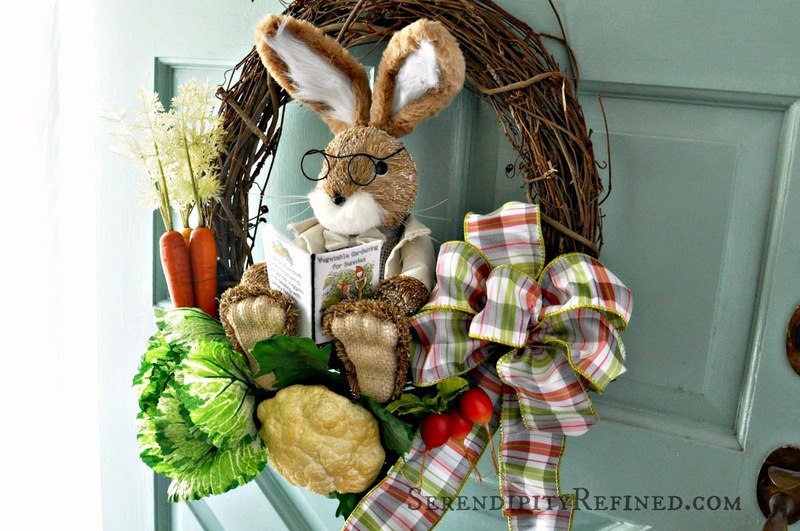 I have a few "extras" put away to fill in after Easter so this wreath will last all summer. As for my little friend, Peter, I was originally going to use a gray stuffed bunny that I had but when I spotted this guy a few weeks ago at Pier 1 and couldn't resist him. 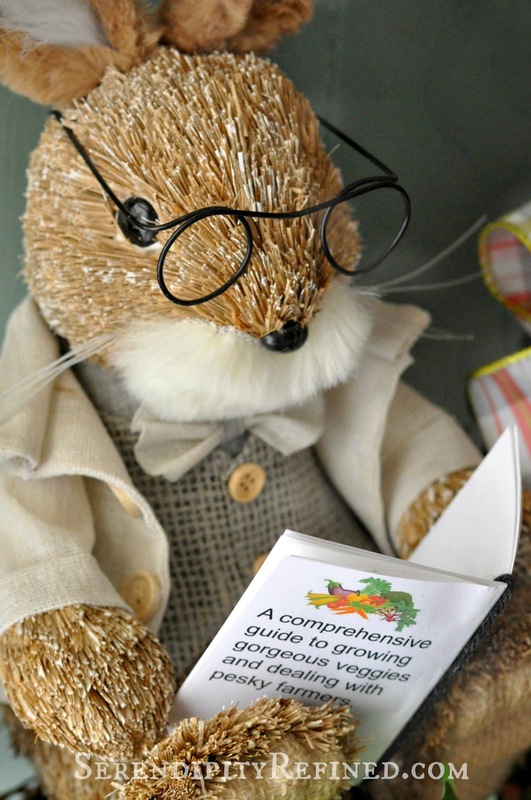 From his fuzzy ears to his dapper blue-gray burlap vest to his ivory linen bow tie and jacket and reading glasses, he stole my heart immediately. 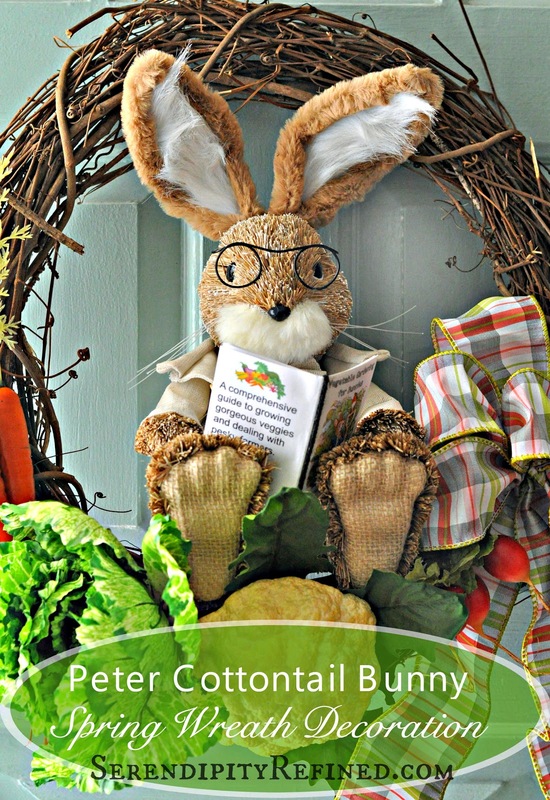 Peter Rabbit was the theme of my oldest's nursery so I've always had a soft spot for this slightly naughty little bunny..
"Vegetable Gardening for Dummies Bunnies". 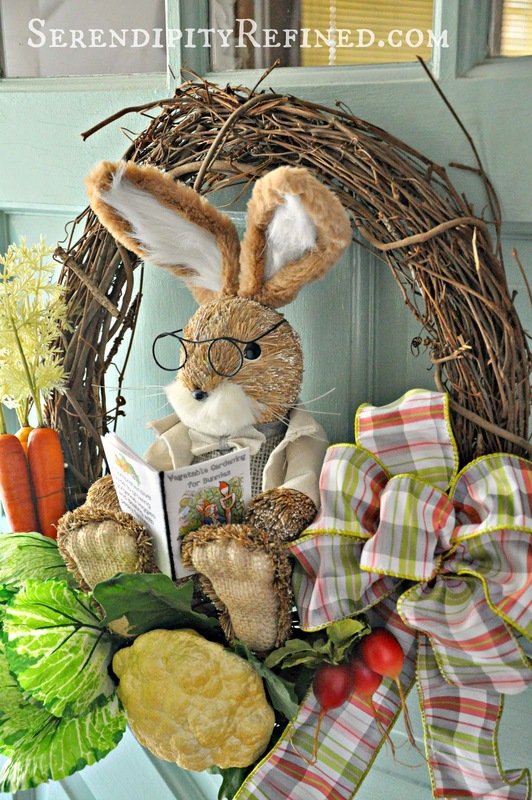 I envision that the book wouldn't actually be a about raising vegetables as much as it would be one which contains directions for how to harvest them from local gardens....bunny-style. If the rabbits in my neighborhood are any indication, baby bunnies are taught how to raid vegetable and flower gardens by their mama's and daddies even before they leave the nest. Trust me, I spotted a couple in my yard at 5:30 last Thursday morning just as it was getting light. I have no doubt that they were scouting out things to eat even before the first leaves have begun to poke through the still frozen soil. ...and probably telling his friends that he overheard me talking about where I'm planting my vegetable garden this year and what's going to be in it. Sneaky rabbit.